As China develops its armed forces, what role does competition with the United States play in shaping the military aerospace capabilities development of the People's Liberation Army (PLA)? How does China decide whether to copy from a leading foreign aerospace power or to develop a new and innovative approach to accomplishing a mission or fielding a capability? The research reported here was commissioned by the U.S. Air Force (USAF) and conducted by the Strategy and Doctrine Program within RAND Project AIR FORCE. 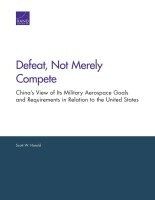 Harold, Scott W., Defeat, Not Merely Compete: China's View of Its Military Aerospace Goals and Requirements in Relation to the United States. Santa Monica, CA: RAND Corporation, 2018. https://www.rand.org/pubs/research_reports/RR2588.html. Also available in print form.